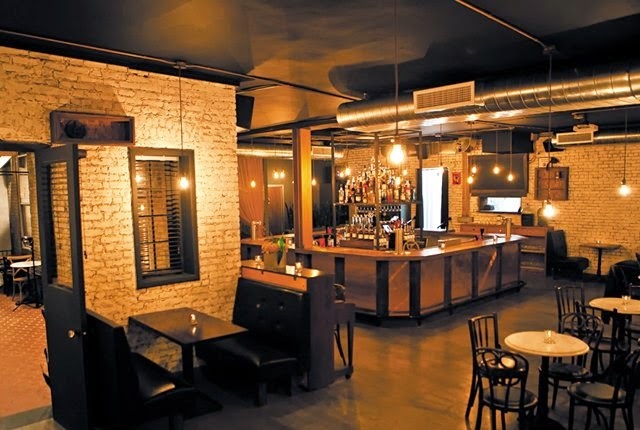 Camp David (221 Ave B, New York, NY, 212-228-0170, CampDavidNYC.com), named after the presidential retreat, offers a dimly-lit, lounge-y destination couched in Manhattan's East Village. Co-owners David Lopez and Carmen Aleman have created a cozy little pillow in which to sip and sup, underscored by flickering candlelight and an ambient soundtrack. When we finally have warmer weather, discover the secret garden in the backyard! 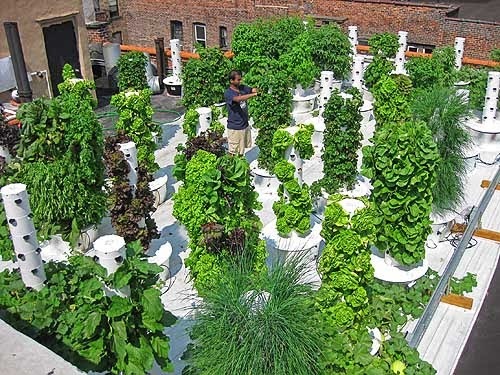 Bidwell restaurant opened early this year in Washington, DC's Union Market, five years after its sister restaurant, Bell Book & Candle (BB&C), opened the first aeroponic rooftop tower garden system by Future Growing in Manhattan (picture shown above). Bidwell’s urban 'roof to table' rooftop garden features a full state-of-the-art rooftop greenhouse with more than 70 of the aeroponic towers and an energy efficient ventilation system. Take a bite out of that! Bidwell is located at Union Market, 1309 Fifth Street, NE, Washington, DC, 202-547-0172, BidwellDC.com; Bell Book & Candle is located at 141 W 10th St, New York, NY, 212-414-2355, BBAndCNYC.com. Need a food travel companion? Check out the iPhone App, I Know The Chef, which just expanded its service from New York to cover Miami and Chicago as well. Launched by New York native Joshua Stern, I Know The Chef offers hard-to-get reservations at restaurants, as well as on-the-house perks, preferred seating, etc. in these three fabulous cities. Free and available at IKnowTheChef.com. LUCKYRICE recently announced their fifth annual LUCKYRICE New York Feast presented by Bombay Sapphire East Gin taking place on Friday, May 2. Included in the festivities will be street food from Night Market, Asian fine dining concepts from Grand Feast and cocktails from Cocktail Feast, all pulled together into a one-night blast at the Mandarin Oriental New York. The itinerant LUCKYRICE affair will also pop-up in Los Angeles (August), San Francisco (September), Las Vegas (October) and Miami (November) coordinated with Asian celebrations such as Thai Songkran (New Year) and A Mid-Autumn Lantern Cocktail Feast. “Our wish is to bring Asian culture to life through the lens of food and drink, and celebrating key dates in the Asian calendar allows us to do just that,” said LUCKYRICE founder Danielle Chang. Go to LuckyRice.com for more information and tickets. The Hudson Bond in Manhattan is muy caliente with their Cinco de Mayo specials this year. Raise a cervesa with Tacos in 2's including marinated flank steak, buffalo chicken, beer battered grouper and Cajun grilled snapper. 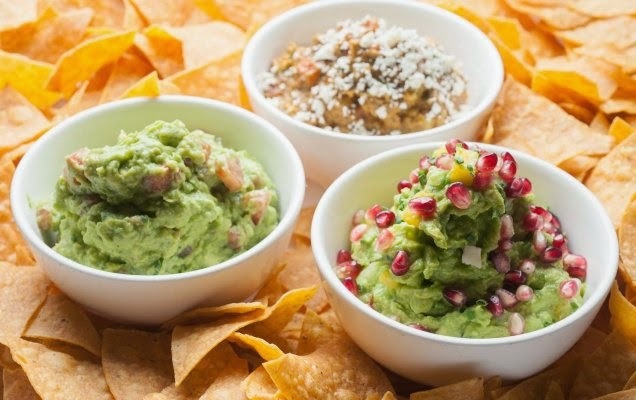 Order any of these with all the traditional accompaniments—you know, avocado, tomatoes, onions (and even a little of the unexpected, such as pineapple salsa!) and get a complimentary, fruity margarita on the rocks. Otherwise, if you wish to drink only, margaritas and curious concoctions called Mayan Mules are four bucks all night. The Hudson Bond is located at 215 W 40th St, TheHudsonBond.com. Our dear friends and neighbors from across the hall recently moved out and across town (and not because of us!) as you might have read from this post. As they were creating their new, larger apartment, they also wanted to create a better, proper kitchen with basic essential cooking tools. When asked what I recommended, I readily complied and provided a list. Kitchen appliances can be expensive but if you invest in good equipment, you'll never need to replace any of it. Excellent knives are a must. Take your time with your purchases perhaps, don't leap in all at once, and get a hold of what you need for your recipes as you merrily cook along! Do enjoy your kitchen and remember Williams-Sonoma is heaven! We dabbled with this dish, putting our fingers into some frozen fish that we had on hand and we suggest you do the same. Look to salmon, hake and halibut as we did for a variation to the pie recipe found here (conversions also at your discretion) courtesy of the utterly charming J Sheekey, Baby's favorite restaurant in London's Covent Garden. Such delightful way to prepare this delish fish! Do enjoy! Baby and I had Easter to ourselves this year (except for a few calls to and from family). This did not, however, stop us from making a considerable amount of food. A lamb recipe courtesy of Eleven Madison Park inspired me to make a Greek Easter dinner, having made a Roman Easter holiday not too long ago via Saveur magazine. I thought to take another trip across the world! This was not exactly a sit-down: we lazed and grazed the entire afternoon, watching movies in between our preparations while maneuvering the dishwasher and putting out the next courses when we were hungry again. Our table was colorful; scribbled in pink and periwinkle blue with gold foil chocolate rabbits, brass candlesticks handed down to me from a relative and my Nana's beautifully etched Champagne glasses from the 1920's for a proper toast. So fun! After having some jelly beans for breakfast, we launched into an easily made, classic velvety avgolemono soup with lemon and orzo (instead of suggested long grain white rice) shortly after noon. Also we cut corners by using purchased College Inn broth with roasted chicken thighs that we had on hand, instead of making our own arduous stock. Our pasta course was served with fresh fettucine and canned artichokes--not the heart-breaking, endless peeling variety and only sauteed briefly, not roasted as the recipe suggests. We shared a split of starched and dry Pommery Champagne, Brut Classico with this dish. Two frenched racks of lamb were the mains, seen here mainly unadorned, before we slathered tzatziki on it. I did not suffer over suspending and draining the cucumbers for 48 hours as the recipe suggests to make the cucumber yogurt; I merely ordered delicious prepared tzatziki from FreshDirect.com. Almond fig cake with pistachio gelato was a fine dessert, with of course some chocolate eggs and more jelly beans that were scattered about. This was a great finish with some high-octane Ouzo! Revel in such a morning? What light upon us! Pinkies Up! - Mas Margaritas! It's hardly a secret that I enjoy a frosty margarita from time to time--click here to peer into a recent post about my penchant for the frosty favorite. As we eagerly move into summer and plan our getaways, consider visiting these hot spots in Puerto Rico and naturally take the time to take a tipple--margarita recipes provided below for your enjoyment just at home as well with a festive group of friends. Right on time for Cinco de Mayo! Have a Margarita Premium just the way you like it at the Patio del Nispero restaurant in the Hotel El Convento, the historic AAA Four-Diamond property located in the heart of Old San Juan, Puerto Rico. ElConvento.com. Mix everything together in a shaker with ice. Shake for two minutes and serve in a chilled margarita glass or on the rocks. For the frozen margarita, haul out the blender and set to work. Garnish with lemon or lime. This family-friendly beachfront property in San Juan, Puerto Rico offers this tangily delicious treat. SJCourtyard.com. Simply mix all ingredients in a shaker and then garnish with a slice of lime and orange! Celebrate the summery season with a fruity adaptation with a Strawberry Mango Margarita available at the hotel’s Café Pierre. SanJuanDoubletree.com. Mix all ingredients except the mango. Shake with ice or blend for a frozen margarita; serve first the mango for the color effect and follow the mixed ingredients in a cold margarita cup with brown sugar in the border. Go loco for coconuts at the Copamarina Beach Resort in Guanica, Puerto Rico and try their signature Coconut Margarita at the beach or poolside. CopaMarina.com. Mix Patron, Malibu, St. Germaine, coconut water and vanilla bean in a shaker. Pour into a glass rimmed with toasted coconut. Drizzle with Coco Lopez and squeeze in the lime wedge. Garnish with a lime peel. Castelvetrano is a town in Sicily that I recently discovered has the most marvelous, sumptuous olives. I first learned of these beauties pressed to make the olive oil at Tavola and then went in for the olives themselves, so perfect for a relish tray as my parents do, accompanied by celery, carrots, a cheese of your choosing and perhaps some crackers around cocktail time. 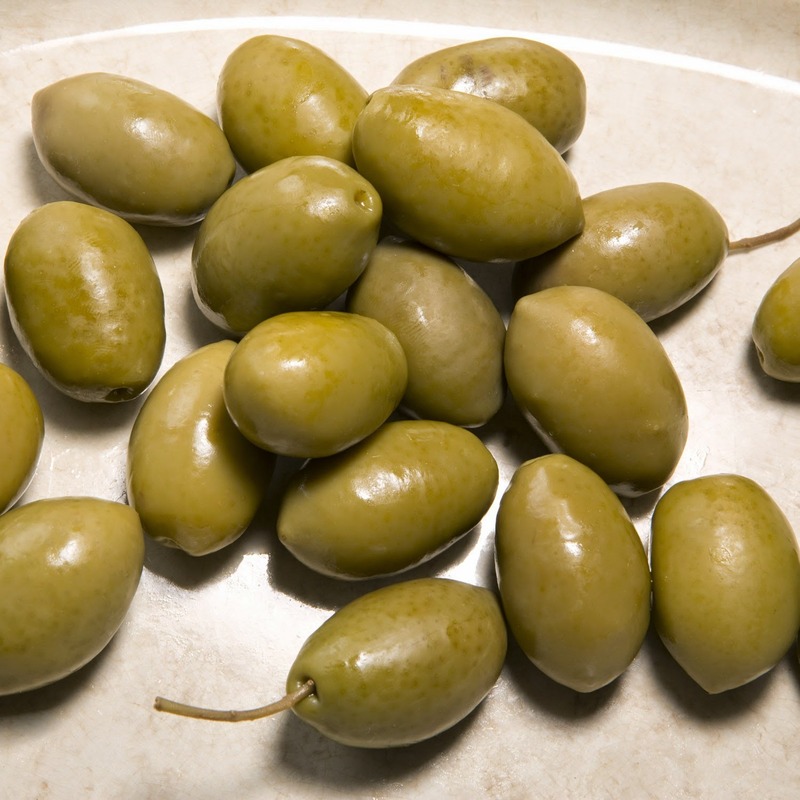 You may cook with the Castelvetrano olives as well of course perhaps for a Mediterranean dish of chicken with preserved lemons, but they are so vibrantly green, chewy and full of fruit flavor that I feel cooking them would dampen their flight. But do what you will; certainly use the olive oil for special occasions such as enlivening a salad dressing or outfitting a chilled salad itself with these plucked orbs. Mind the pits! Above all--do enjoy! Thanks to Murray's Cheese for the photo. Pinkies Up! - Let Us Begin With Gin! Gin is in the air, er, rather spring is in the air! Bend an elbow, lift a glass or whatever you may. 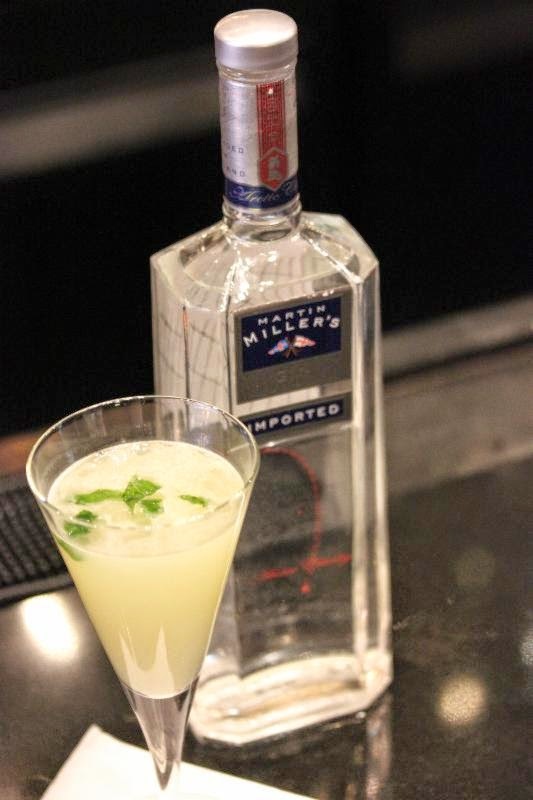 Above all, let's make a toast with these gin-fueled cocktails--and thanks to Martin Miller's gin for the memories! 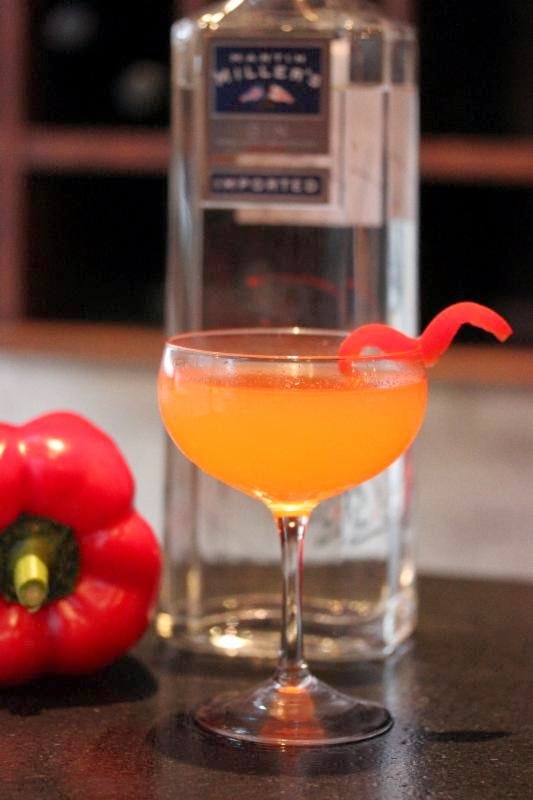 Muddle the red bell pepper with the lemon juice and ginger marmalade; add the Martin Miller's Gin and pomplemousse rose and shake with ice; double strain into a coupe glass; cap it off with a sliver of red bell pepper and gird your loins. 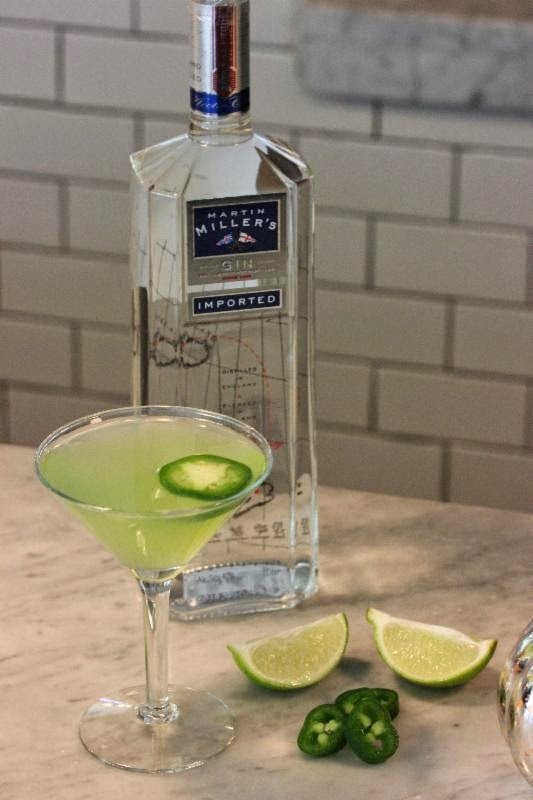 Lightly muddle the basil, jalapeno and simple syrup; add the gin and ice a stir thoroughly; strain and serve in a martini glass; garnish with a slice of jalapeno and casually traipse across. Combine all ingredients in a shaker with ice, shake, strain and serve up in a martini glass; garnish with micro-basil and enjoy the sentiment of spring. Add the basil to the water and boil at medium heat until the liquid is reduced to two cups; strain out the leaves and mix the basil water with two cups of sugar; bring the mixture to a boil, stirring until the sugar is dissolved; allow the mixture time to chill and store in refrigerator. One of my favorite restaurants, Bea (formerly Le Madeleine), is now serving weekend brunch with a menu by Chef Anunya Clarke. 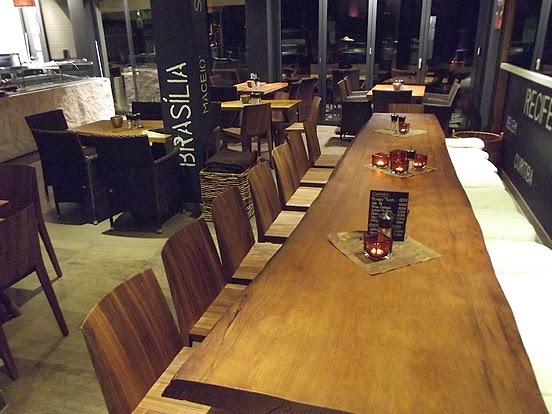 Dine in the charming atrium or sidle up to a banquette in the restaurant proper. Among the other tempties, have your pick of pancakes with rosemary honey and berries or a smoked salmon sandwich with ricotta cheese, tomato, dill, and capers. Drinking at brunch is practically a necessity so knock back a bubbly Aide Memoir with prosecco, sweet vermouth, yellow chartreuse liqueur and orange bitters to further fulfill your fare. For a fuller picture, read my review of Bea here. 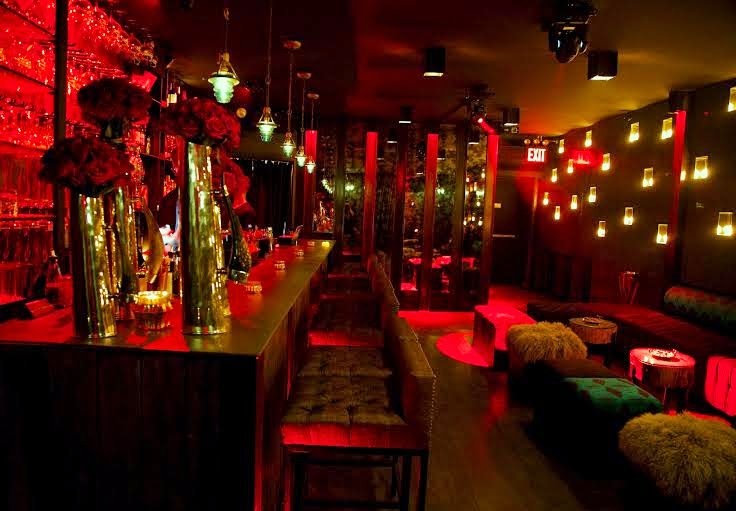 Bea is located at 403 W 43rd St, New York, NY, 212-602-1910, BeaNYC.com. soups--Mageritsa soup made from lamb offal and classic lemony Avgolemono soup; traditional Dolmades, stuffed grape leaves; Roasted Lamb; and Pork Tenderloin with stewed gigantes beans and feta. Finish it off with Tsoureki, a sweet Easter bread. Nerai is located at 55 E 54th St, New York, NY, 212-759-5554, NeraiNYC.com. Chef Milton Enriquez' spring menu at Crescent Grill in Long Island City is busting out all over with locally sourced ingredients from farms in New York, New Jersey and Pennsylvania. English pea risotto rhapsodizes with duck confit and blue foot mushrooms; lobster is poached with butter; and wild striped bass is served with artichokes, olives, fingerling potatoes and hon-shimeji mushrooms. An Easter Day Prix-Fixe brunch menu is $35, available from 11am-4pm and includes a main course and savory and sweet selections for the table. 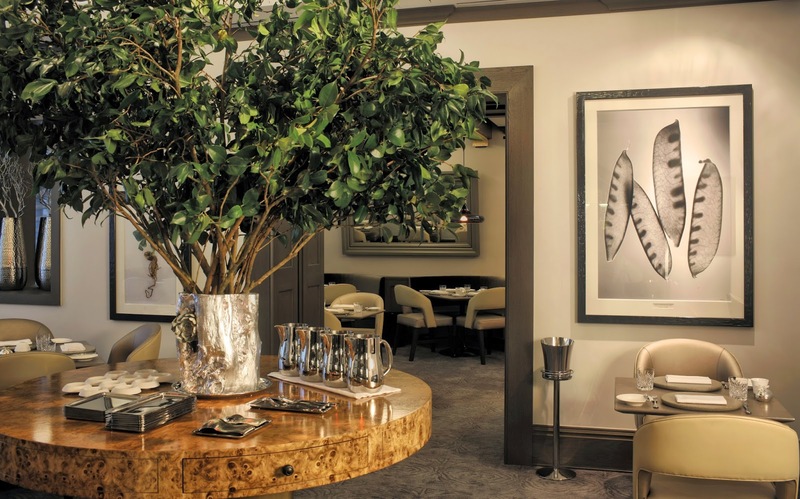 Mushroom tartlets, hanger steaks and a green tea financier sound pretty good to me! Crescent Grill is located at 38-40 Crescent Street @ 39th Avenue, 718-729-4040, CrescentGrill.com. 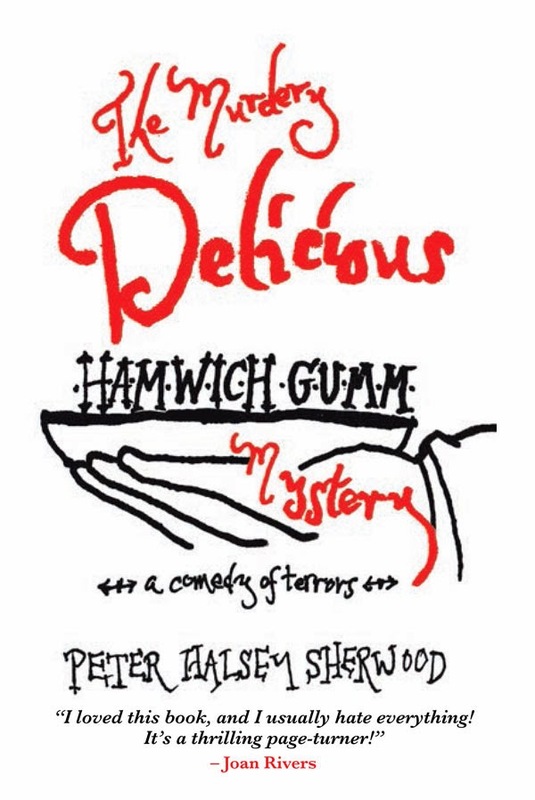 My first podcast interview talking about my books the pale of memory and The Murdery Delicious Hamwich Gumm Mystery! 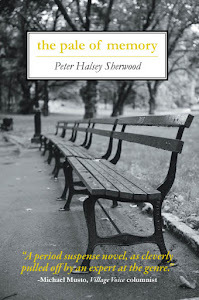 And my blog Evenings With Peter! Click here to lend an ear. 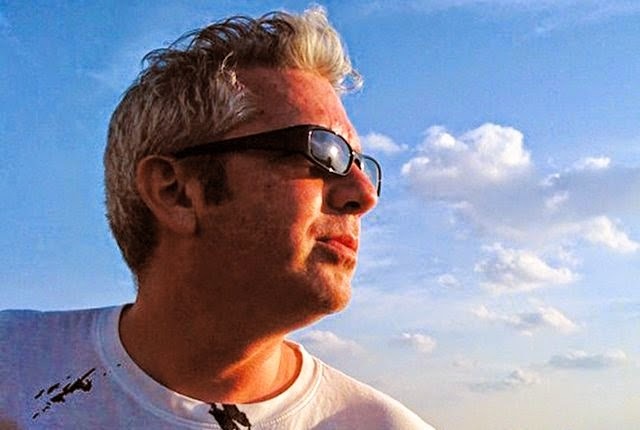 Thanks to the folks at WritersBone.com! 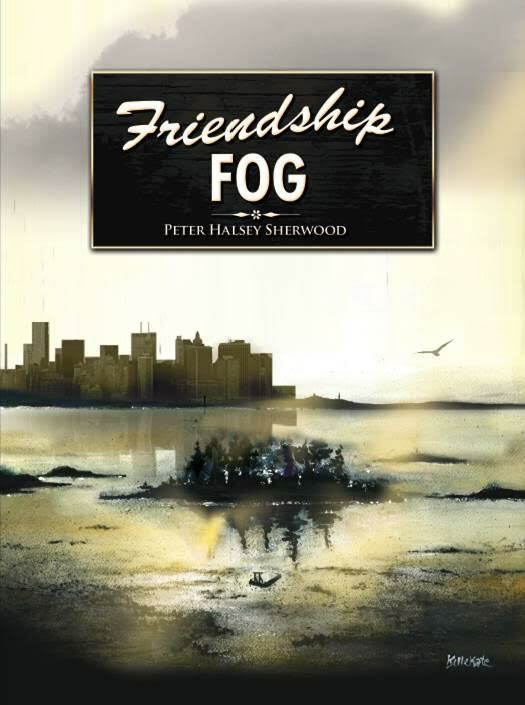 Also go to PeterHalseySherwood.net for more info. Cagen (414 East 9th St, 212-358-8800, New York, NY, CagenRestaurant.com) an elegantly understated Kappo Ryori 30-seater restaurant (10 also fit in at an imported Japanese Keyaki wood counter), brings formidable Chef Toshio Tomita's upscale, traditional Japanese cuisine to the East Village in Manhattan. His considerable credits include managing Nobu New York, Nobu Next Door and Nobu 57 and serving as a corporate chef for Nobu Restaurants. 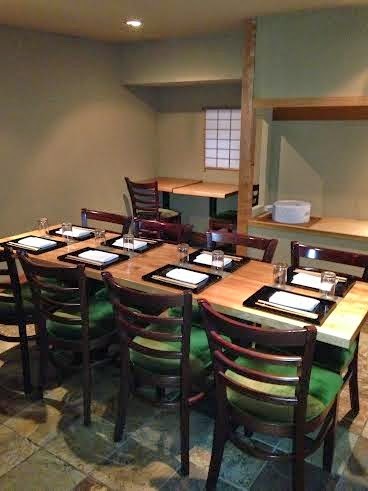 Cagen translates to “adjusting,” which is fitting as this is the first time kaiseki Chef Tomita has taken center stage. When can we go next? Juni (12 E 31st St, New York, NY, 212-995-8599, JuniNYC.com) jumps into a fresh-as-spring menu with Executive Chef Shaun Hergatt’s new dishes that pay homage to childhood favorites and lessons learned in culinary school before he became the Chef/Owner of Michelin-starred SHO Shaun Hergatt. I love this restaurant—read my review here as evidence! The new menu reflects Japanese kaiseki cuisine but also look for the beet tuile canapé and the rhapsodic riff on the Cherry Ripe chocolate-cherry candy bar Hergatt grew up eating in Australia (a foie gras bombe, anyone?). Black bass with English pea shoots, fennel, Crystal lettuce, and white balsamic sauce; a rabbit loin roulade with carrots presented six ways, radishes and green-peppercorn cream sauce; gnocchi with sea urchin and crab sauce; frogs' legs with fava beans and white balsamic gelee…ooh, such a caution! DARUMA-YA (428 Greenwich St, New York, NY, 212-274-0428, Darumaya-NYC.com), a cozy Japanese izakaya and soba noodle house debuted this week in Tribeca. The long lounge casually conspires to feature an elegant, wood-paneled dining room with wooden floors and cushiony dark wood chairs embraced by a splash of burgundy. Soba Master Shuichi Kotani (who has taught everyone from legendary Chef Joel Robuchon to Top Chef’s Gail Simmons to make soba) hand-cuts and hand-rolls the delicate noodles, made from Japanese buckwheat, into hot and cold soba dishes such as duck soba, Japanese bottarga soba and sashimi soba. Chef Nobuhito Dosei prepares the izakaya menu. There are fish dishes such as sashimi, tartar and carpaccio and hot dishes include grilled lobster with sea urchin and mayonnaise sauce. 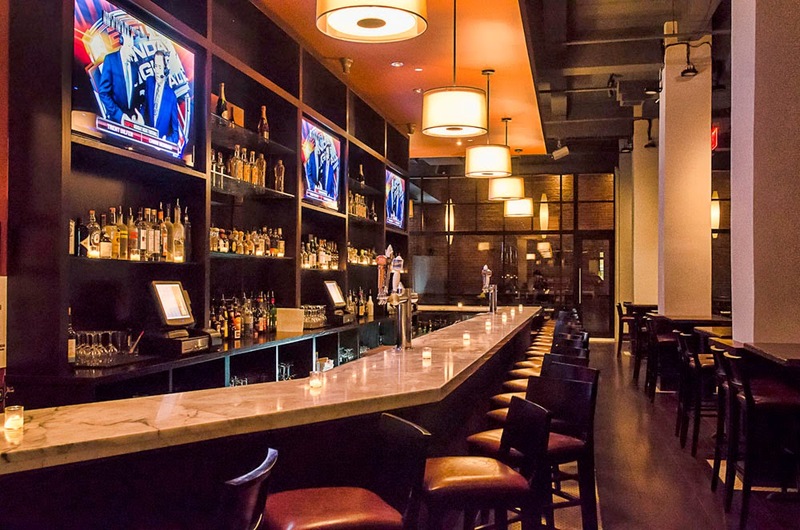 The full bar offers a selection of sake, beer, Japanese whiskies, and specially crafted cocktails. Classic French cuisine has settled into downtown Manhattan as Jacques Ouari, entrepreneur and leader of the Jacques Restaurant Group, takes Jacques 1534 (20 Prince St, 212-966-8886, New York, NY, JGNYC.com) into its next decade with a new menu featuring approachable comfort food with cavorting cuisine and a carefully curated selection of handcrafted cocktails. Signature dishes initially found at the original Jacques Brasseries on the UES (mussels, steak frites, organic roasted chicken and warm chocolate soufflé) are still available at Jacques 1534, but there is also a new, mostly French-UK element at play (as well as other international influences); a little bit French bistro, a little bit English pub. Starters include black kale salad, and speck and Napa cabbage with tart-sweet dried cherries a drizzle of olive oil. Mains include Chatham cod fish ‘n’ chips; pan-seared Nile perch, served with basil couscous and harissa vinaigrette and braised short ribs with smoked-paprika mashed potatoes. Desserts include French classics such as crème brulèe and tartes aux pommes. Seasonally inspired cocktails incorporate fresh squeezed juices, house made purees and syrups with the hooch. 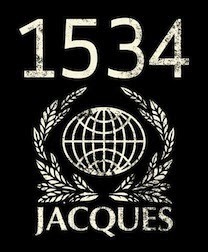 Cheers to the Jacques 1534 crafted with Hendrick's Gin, lemon juice, simple syrup, fresh mint and cucumber. A votre sante, mate! I’m pretending that it’s summer already (although I do cherish spring with all the teasingly warm and suggestive inspiration that it brings)! Here I present a couple of summery cocktails to jump-start the season properly, featuring Cruzan Peach rum. The juicy peach flavor celebrates the spirit(s) of St. Croix and surely will raise yours as well. Cheers then and pinkies up! Method: Lightly muddle lime wedge, spiced honey syrup and basil leaves in a shaker. Add ice and Cruzan Peach rum. 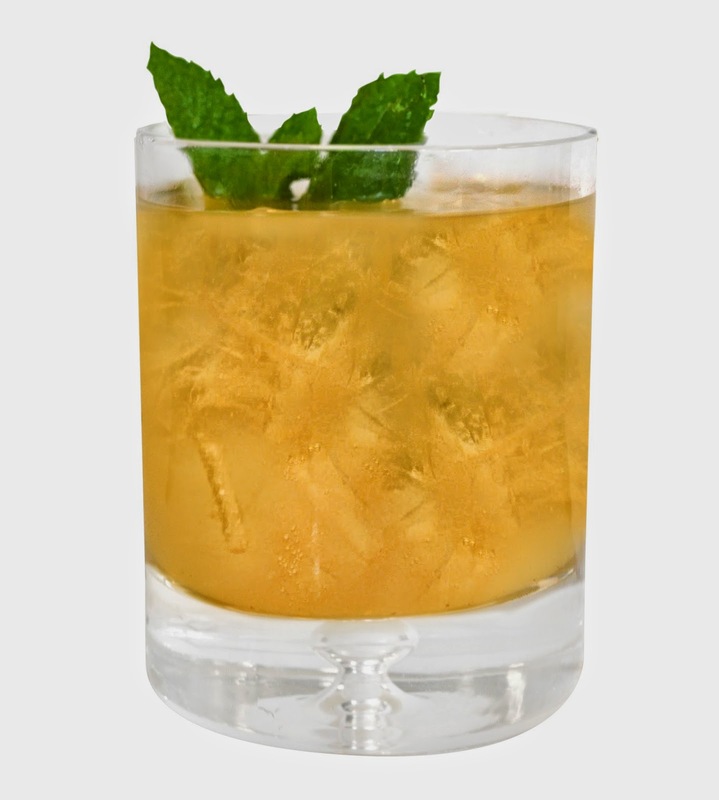 Shake lightly, pour into collins glass over ice and top with soda. Garnish with a sprig of fresh basil. Method: Combine 6 parts honey and 6 parts hot water. Add 1/2 tsp cracked pepper and 1/2 tsp. cinnamon. Stir and set aside. Baby let some big pork chops liberally coated with applewood smoked salt sit over night in the refrigerator while I conspired to make my red eye gravy. The pork chops are made especially juicy by the simple brining process and the gravy gilds the lily! Wipe the salt off of your chops before stowing them under the broiler in the oven for six minutes each side, second to top rack. Then cover in foil and let rest for 10 minutes. To the gravy! This was really fun and pretty much made up, based on the Southern tradition: we had homemade pork stock (chicken or turkey stock would work as well) on hand so after about five cups had been thawed, we heated it up, added a 1/2 pound of crumbled bacon (spicy ham is perhaps more common) that had been cooked in a separate pan and when no one was looking, we also added some of the bacon grease into the mix. Six tablespoons of flour were whisked in after that as well as two cups of still steaming coffee. Reduce for about 15 minutes and grind some fresh pepper into your brew and serve over your chops. Creamy mashed potatoes and steamed asparagus with a simple buttermilk dressing courtesy of Jamie Oliver are ideal companions for this--and of course by all means make chocolate pudding topped with whipped cream for dessert. Thanks to Recipe.com for the photo! Easter is less than two weeks away--spring lamb is what's going to be on our table this year! Baby and I are making it easy with dinner for just the two of us. Not sure yet what will round out the rest of the menu but I'm thinking of a Greek slant this year based on the lamb recipe, with lemon chicken soup (classic Greek avgolemono) to start, a pasta course with grilled artichokes and a dish of dates and figs for a fine finish. Although I am not a fan of Greek retsina wine (shocking, I know), I do believe a chilled, fizzy bottle of Perrier-Jouet Champagne will be an ample substitute! Line a colander with a quadruple layer of cheesecloth and pour the yogurt into the cheesecloth. 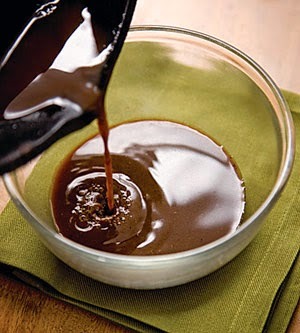 Suspend over a large bowl and refrigerate for 48 hours, allowing the moisture to drain from the yogurt. Peel and grate the cucumbers on a box grater. season with 1 teaspoon of salt and hang in a quadruple layer of cheese-cloth to drain excess moisture, about 1 hour. Measure 1 cup of the drained yogurt and reserve the rest for another use. Combine the cup of yogurt and the drained cucumbers in a medium bowl. stir in the lemon juice and olive oil. Grate the garlic on a Microplane grater into the mixture and fold in the chopped dill. Mix well and season with salt to taste. Preheat the oven to 300°F. Heat a large cast-iron skillet over high heat. Season the lamb rack generously with salt. Place the rack in the skillet fat side down and sear over high heat until browned, 21/2 to 3 minutes. Turn and sear the bottom for 1 minute. Turn the rack back onto the fat side and add the butter, thyme, and garlic. Baste the rack with the butter for 21/2 to 3 minutes. 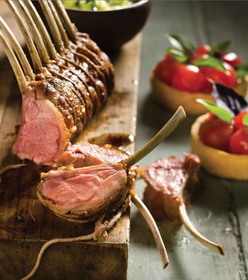 Transfer the lamb rack fat side up to a wire rack set in a rimmed baking sheet and roast in the oven for 10 minutes. Turn the lamb rack over, baste with butter, and return to the oven for another 10 minutes. Remove the lamb rack from the oven, turn it back over, and baste once more. Roast in the oven for another 10 to 15 minutes, until the internal temperature reaches 130° to 135°F. Let the lamb rack rest for 10 to 15 minutes before slicing. Serve with the cucumber yogurt and heirloom tomatoes. Thanks to Eleven Madison Park for the recipe and photo! Southeastern Europe meets Southeast D.C. at Ambar on Capitol Hill with peasant food rendered to nouvelle cuisine. The Balkan states are comprised by of a group of nations that make up Southeastern Europe. They include Croatia, Slovenia, Bulgaria, Serbia, Bosnia-Herzegovina, Montenegro, Albania, and Macedonia. The region (heavily influenced by Turkish, Roman, Slavic and Greek cultures), stretches from the Black Sea in the east to the Adriatic Sea in the west and is anchored by the Mediterranean Sea towards the southwest. Balkan cuisine is made up of about 20 main dishes, ranging from seafood to typical inland dishes, resulting in delicious, eclectic fare. 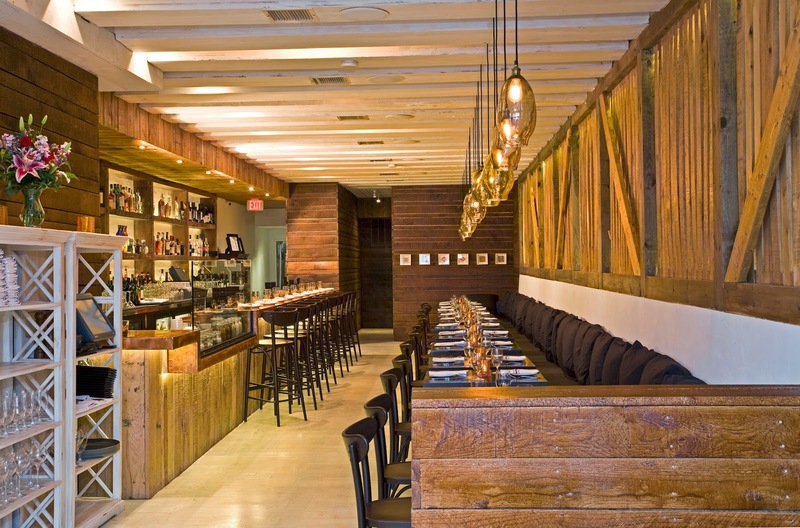 Ambar means “barn” in many Balkan languages and the interior of the restaurant, with its silvered planking and heavy wooden beams, is a warm and welcoming version of the thousands of wood and stone barns which dot the Balkan landscape. Rakia--I chose the Flores zuta osa plum and Slivovitz. Typically, Rakia, similar to brandy or grappa is enjoyed either before or after the main meal, but never with it. I took mine after dessert, as is the Croatian/Dalmatian custom. Ambar has an extensive Rakia menu, but be careful, it is strong. One is all you need, two at the very most--and to further borrow from Dorothy Parker, "Three, you're underneath the table! Four, you're under the host!" Ambar is located at 523 8th St SE, Washington, D.C., 202-813-3039, AmbarRestaurant.com. 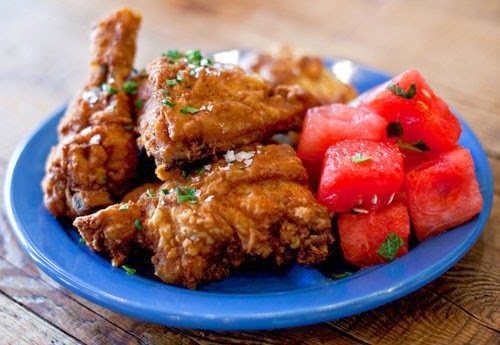 I love this self-proclaimed "Southern Table & Bar"! 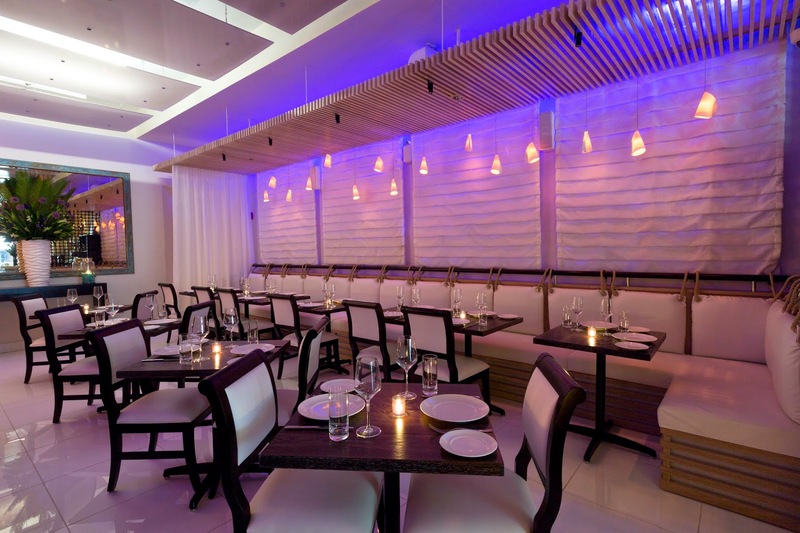 On my most recent visit to Miami (not the warm weekend winter getaway I was hoping for--I froze and wore everything I'd packed all at once and hardly even dipped my toes in the ocean), Baby and I went to eat here twice and it was terrific both times, staffed by a very kind, accommodating team. And such a fun crowd bending elbows about the bar and of course, eating! Steak tartare; in a Mason jar! Yardbird 1600 Lenox Ave, Miami Beach, Fla. 305-538-5220, RunChickenRun.com; 50EggsCompanyStore.com. 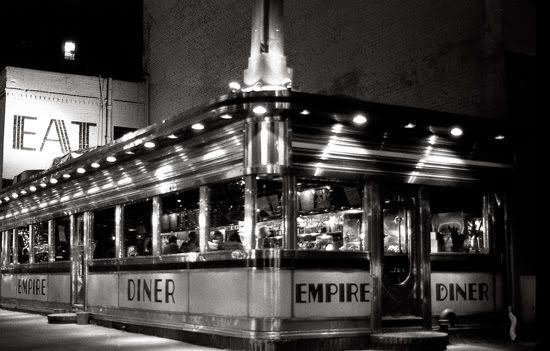 The retro Empire Diner has been around forever and though the iconic Chelsea spot has wobbled about, closed and re-opened several times over the past few years, I've absolutely fallen in love all over again since it was recently revived with Chef Amanda Freitag helming the kitchen. Thanks to Gregoire Alessandrini, UntappedCities.com for the image! This was so easy and somewhat unexpected! My friend came over for dinner at the last moment--we had plans to meet elsewhere but the weather was decidedly inclement and I did not want to venture outside. But what to serve? 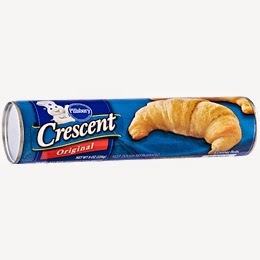 A tube of Pillsbury crescent rolls coiled inside the refrigerator beckoned; I had some sliced pepperoni and fresh mushrooms in there too. I whipped up an easy Alfredo sauce as I already had butter, heavy cream (sometimes for coffee, eeek), garlic and Parmesan cheese on hand. After concocting the sauce, I let it simmer on low heat. Meanwhile, I sauteed the mushrooms in butter and put the crescent dough in the oven flat-out on a baking sheet for half the suggested cooking time (a mere five minutes) before taking it out, slathering the sauce evenly upon it and topping the whole thing with the mushrooms and pepperoni. It went back into the oven for another five minutes or so until nicely golden brown. When cool enough to handle, I rolled everything into a log, like an ersatz Stromboli and finished it with steamed spinach. Et voila! Dinner! A stiff red wine is good for this, and perhaps some green beans almondine. A simple salad lightly dressed with balsamic vinegar and a little olive oil is also a nice accompaniment. Why not serve a gelato of some kind such as pistachio or stracciatella for dessert? Do enjoy! No foolin'! 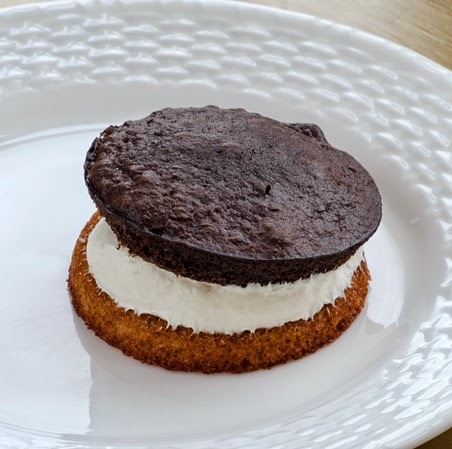 Seasonal whoopie pies courtesy of Elizabeth Fife, founder and CEO of Batter & Cream (86 W 12th St, New York, NY, 917-496-4947) will be whipped up from her bakery and featured during the outdoor season at Smorgasburg in Brooklyn, starting April 5th. Look for tempties such as Banana and Salted Caramel, Earl Grey Honey Whiskey, S’mores, and Chocolate Peanut Butter Pretzel. Lick it up, er, rather look it up at BatterAndCream.com; Smorgasburg.com. April is National Grilled Cheese Month apparently. I thought every month was National Grilled Cheese Month. And April 12th is Grilled Cheese Sandwich Day and one way to celebrate is by going to Brazilia Cafe (684 Broadway, New York, NY, BraziliaCafe.com). The gooey stuff is featured Brazilian style with their Grilled Jamon e Queso, which features ham, gruyère and pineapple relish. National Empanada Day is April 8th and also being feted at the café in case you were wondering. Passover begins April 15th, so consider a pilgrimage to Toloache Thompson (205 Thompson St, New York, NY, ToloacheNYC.com) for Julian Lopez’ (Iron Chef America) Jewish-Mexican Passover fare. Naturally there’s kosher tequila, matzo ball soup made with jalapeno scented chicken consommé and along with the requisite carrots there is also epazote! Costilla de Res will feature braised short ribs (think a sort of flanken) with Chile ancho salsa and pickled vegetables. Shalom, señor. 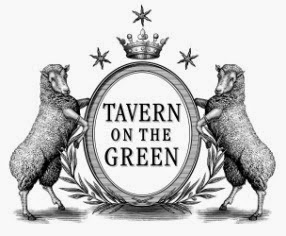 The legendary Tavern On The Green in Manhattan’s Central Park is open once again and they mean business! 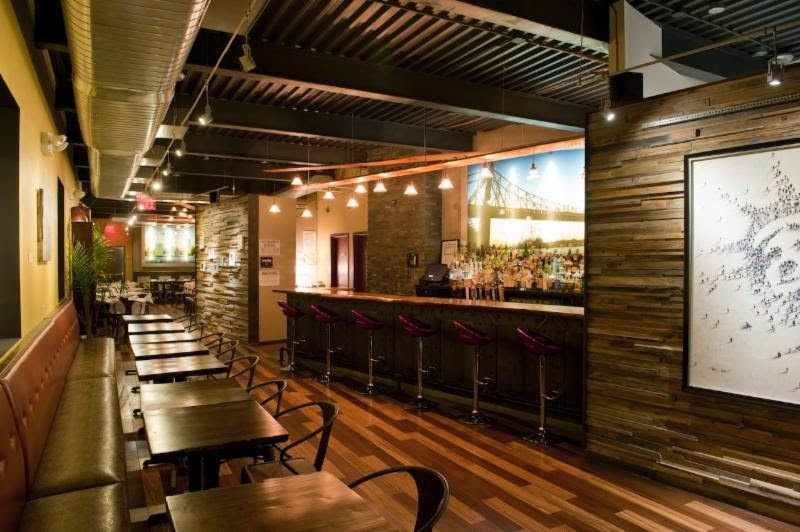 Restaurateurs Jim Caiola and David Salama of The Emerald Green Group, alongside Chef Katy Sparks and General Manager Celso Moreira are serving up a preview dinner menu on April 24th. Amid all the excitement, don’t forget Mom—there’s a brunch service Mother’s Day weekend May 10th & 11th, before the restaurant launches a grand opening May 13th. For reservations go to TavernOnTheGreen.com or call 212-877-TOTG (8684). Go Green! At the end of the month, Manhattan By Sail is hitting the high seas, as it were, with views of the Manhattan skyline. Starting April 26th there will be a Craft Beer Tasting aboard the Clipper City and on April 27th the Wine Tasting & Champagne Buffet Brunch will float away on the Shearwater. Go to ManhattanBySail.com for more info about these events as well as many others—I personally have my eye on the cruise for lobster and beer lovers!